With a society that’s always on the go, it’s no surprise that tablets are so popular in today’s world. There are not many devices that offer the same portability and usefulness that a tablet does. It is the perfect sized device for all your entertainment needs and even more with a screen that is bigger than a phone but smaller than your average laptop. Plus, tablets are so easy to use that even a child can figure it out. 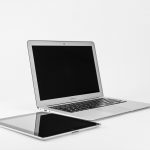 If you’re considering buying a new tablet, you’re likely overwhelmed by the large selection of tablets on the market that all claim to be high-performing devices with a large array of special features. However, not all tablets are built the same, and they aren’t priced the same. While some tablets are less than $100, other tablets can cost as much as $600 or even more. 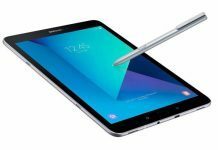 If you are looking for a budget tablet that will cost $250 or less, the Samsung Galaxy Tab 4, not to be confused with Samsung’s newest tablet the Galaxy Tab S4, might be a good pick for you. This tablet is one of Samsung’s older models that comes at a lower price. Continue reading to get a thorough analysis of this device and all its specifications so that you can decide if this is the tablet for you. 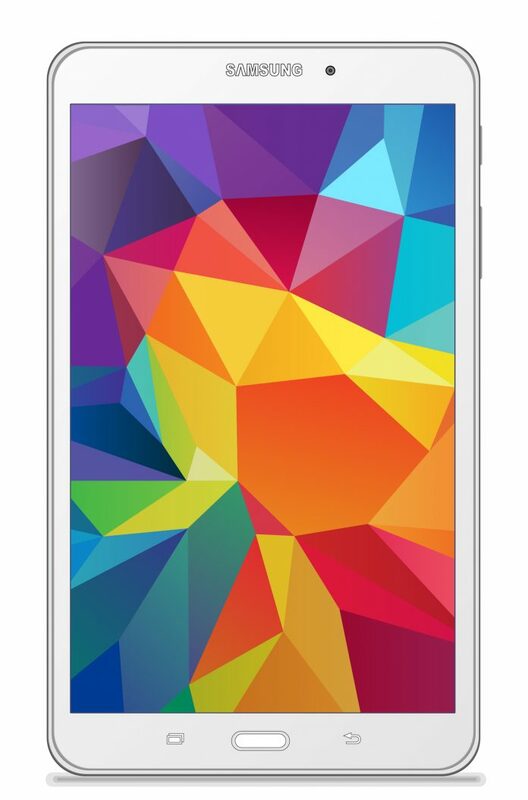 What is the Samsung Galaxy Tab 4? The Samsung Galaxy Tab 4 is designed to be an affordable, mid-line tablet to meet all your entertainment needs. This tablet came out in 2014, so it is an older Samsung model. Samsung no longer sells the Samsung Galaxy Tab 4, but you can still buy this product through other retailers. If you buy a tablet from Samsung, you can be sure you are buying from a trusted brand that is known worldwide for selling high-quality electronics. In fact, Samsung is the top seller of smartphones worldwide. Samsung’s Galaxy smartphones and tablets are the biggest competitors to Apple’s iPhone and iPad. While the iPad is considered one of the highest-performing tablets out there, Samsung’s Galaxy tablets are often more affordable choices. Samsung sells several different types of tablets, but Galaxy Tab is the name Samsung has given all their standard tablets. 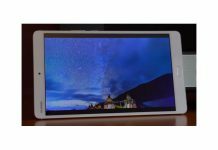 In this part of the review, you’ll get a full break down of the Galaxy Tab 4’s specifications, so you can determine whether it is a quality device. The Samsung Galaxy Tab 4 comes in three main display sizes: a 7-inch screen, an 8-inch screen, and a 10.1-inch screen. 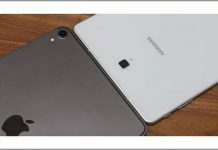 While you might be able to track down a new Galaxy Tab 4 in the 8-inch or 10.1-inch size, most retailers only sell new 7-inch versions of the Galaxy Tab 4. The Galaxy Tab 4 is a pretty portable, lightweight device. It weighs 0.6 pounds and has a thickness of 9 millimeters. This tablet should be easy to grip with its thin frame and textured back cover with a leather-feel. Most people complain that entirely smooth tablets are more slippery and hard to grip, so this tablet’s cover should feel great to hold. Since this tablet weighs in under a pound and has such a small screen, it will be easy to take with you wherever you go and won’t feel heavy in your bag. You could hold this tablet in just one hand for long periods of time without feeling fatigued. Overall, the appearance of this tablet makes you aware that it is indeed a budget tablet. It is made out of plastic, which will make it look and feel cheap. It comes in either black or white, so the color choices are pretty basic. 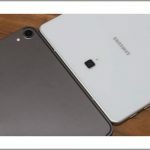 Like many of Samsung’s other devices, there are two capacitive buttons on the front of the tablet on either side of the home button. These buttons are more of a nuisance than a convenience since they get in the way of thumbs and palms and are easily accidentally touched. Plus, these buttons don’t light up so finding them in the dark is nearly impossible. The graphics on this tablet are not great but are comparable to other budget tablets. The main display of the Samsung Galaxy Tab 4 has a resolution of 1280 x 800. It only has 189 pixels per inch and is noticeably pixelated. This tablet also has pretty mediocre brightness and contrast. However, the screen does have a display ratio of 16:10 which allows for better widescreen viewing. The Galaxy Tab 4 comes with a 4000 mAh battery that lasts up to 10 hours. While other devices boast they can offer up to 14 hours of battery life, ten hours is sufficient. Also, don’t expect this tablet to hold a lot of data with only 8 GB of internal memory. You can add more memory with a MicroSD card but only up to 32 GB. This tablet comes with a quad-core processor that has a CPU speed of 1.2 GHz and 1.5 GB of RAM. You shouldn’t expect much performance wise out of this device. While basic apps will likely function without an issue, more demanding apps will be incredibly slow and stutter often. Many customers are very disappointed in how sluggish this device is and said it struggles to play even basic games and doesn’t scroll through web pages smoothly. Another huge complaint about the Samsung Galaxy Tab 4 is that Samsung decided to stop updating this tablet early on. Many apps will not run on earlier versions of Android, which is an extreme inconvenience. When it comes to cameras on tablets, many people are divided on whether a tablet should even have a camera in the first place. However, many companies have focused on improving the cameras on tablets since a lot of people like taking pictures with them. Clearly, the Galaxy Tab 4 wasn’t given this same focus. This tablet has a 3 MP rear camera and a 1.3 rear camera. Many tablets today have rear camera resolutions of 5MP or more. The Galaxy Tab 4 only has one speaker located on the bottom of the device. This speaker is very easy to accidentally block with your hand while holding it. In addition, the quality of audio from this speaker is not good. Even at full volume, this speaker produces sound that is hard to hear and squeaky. This tablet comes with an Adapt Sound setting that allows you to customize how you hear sound when wearing headphones. This way you can optimize your listening experience and alter it depending on your environment. The Samsung Tab 4 comes with a few special features that are worth noting. One of the best features this tablet offers is a split-screen mode that allows you to open two apps at once side-by-side. The tablet still functions normally even with two apps open and is easy to activate by just swiping on the center-right area of the screen. Not all apps will work with this feature, but you can open your web browser and YouTube at the same time. The device is also equipped with TouchWiz which can be useful. This technology makes the user’s experience simple by providing a basic overlay and how-to tips. However, most users complain that this technology takes up way too much precious space. The Samsung Tab 4 comes with Hancom Viewer which makes viewing Microsoft Word, Excel, and PowerPoint documents super easy. You can even download the Hancom Editing Tool to make changes to documents on your tablet. While it is always much easier to deal with documents on a laptop or computer, it can be useful to have access to these documents while on the go with your tablet. On Amazon, the Samsung Galaxy Tab 4 currently costs $249.98 for a new tablet. Although the cost of this tablet had gone down in the past, it progressively rose to its current price which is close to how much it cost when it first was released in 2014. Samsung offers one-year warranties on all their tablets. However, since Samsung no longer sells this particular tablet anymore, it is likely that there will be no warranty. How Does the Samsung Galaxy Tab 4 Compare to Other Tablets? In order to make an informed purchase, you will need to see how the Galaxy Tab 4 compares to other tablets on the market. See how the Galaxy Tab 4’s competitors measure up. The Galaxy Tab A is Samsung’s newest budget tablet. This tablet is only $200, so it is even cheaper than the Tab 4. Although the Tab A is another lightweight, thin tablet, the Galaxy Tab 4 is still thinner and lighter making it more portable. Both of these tablets have the same display resolution of 1280 x 800 and have a single, low-quality speaker, so the graphics and audio will be similar. However, the Tab A performs better than the Tab 4 in almost every aspect with a more powerful processor, a better camera, a longer lasting battery, and more internal memory storage. Additionally, this tablet works with the newest version of Android and should continue to receive updates for the foreseeable future. This tablet has a one-year warranty. 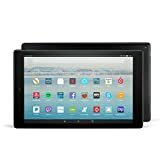 Amazon tablets like the Fire HD 10 have some great perks like being able to connect to an Alexa and all your other Amazon apps. These tablets are also designed to work with Kindle and look good while reading eBooks. This tablet is more powerful than the Samsung Galaxy Tab 4 with a much more powerful processor. The graphics are also better with 1080p Full HD and IPS. This device also has two speakers instead of one. However, it manages to have an even worse camera than the Tab 4 and is even cheaper looking with its large, bulky build. The Amazon Fire HD 10 has a one-year warranty. This Asus ZenPad is cheaper than the Samsung Galaxy Tab 4 and has great quality. Overall, this tablet is one of the best values you can find. It is still a very portable tablet since it weighs 0.69 pounds and is 6.9 millimeters thin. You’ll enjoy how easy this tablet’s interface is to navigate. Although the speakers and camera are just mediocre, you can expect smooth performance and great graphics from this tablet. With a 2K IPS display, you’ll notice how good the picture looks on your screen. You can even customize your viewing experience with VisualMaster Suite. It has a one-year warranty. Overall, the Galaxy Tab 4 is an overpriced tablet that is basically obsolete. Although you can still find and purchase one of these tablets online, there is no reason why you would want to. Even when the tablet came out in 2014, it was a mediocre tablet that was overpriced compared to the competition. 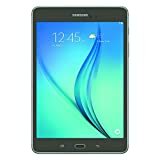 If you really want an inexpensive Samsung tablet, the Samsung Galaxy Tab A is similar to the Galaxy Tab 4 but built to perform much better. Not to mention, it’s $50 cheaper. However, if you’re willing to ditch Samsung completely, then you should go with the Asus ZenPad S 8.0. This tablet performs well and has better graphics than any of the other tablets on this review. Plus, it is reasonably priced making it the best budget tablet you can purchase.